This succulent house plant grows stiffly upright variegated leaves. Some varieties have leaves that are edged with yellow or white. 'Laurentii' is a popular variety that is edged in golden yellow. S. trifasciata 'Hahnii' is a low-growing (6 in/15 cm) variety. 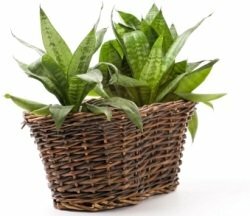 Its compact, rosette form gives it the common name Bird's Nest Sansevieria. 'Golden Hahnii' has yellow leaf margins...'Silver Hahnii' has silvery leaves marbled with dark green. S.t. 'Hahnii' (shown at left) is a compact, low-growing variety that only reaches a few inches tall. Clusters of small, white flowers sometimes grow at the base of a plant when it is a few years old. It rarely blooms indoors, and it may go years between flowering, so it's a nice surprise when it does. Mother-in-Law's Tongue is ideal for beginners, but seasoned gardeners also love this accent plant's dramatic, sword-shaped leaves. Slow-growing, it will live for many years with good care. Water the soil, taking care not to get water on the leaves, which will cause them to rot. If the leaves turn yellow, or get soft and mushy at their base, it's overwatered. 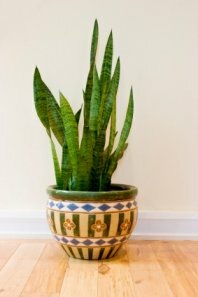 Any problems with growing Sansevieria are usually related to watering. Allow the top inch (2.5 cm) of soil to dry out between waterings during the growing season. In winter, water just enough to prevent the soil from drying out. Overwatering will cause root rot. Keep the leaves dust-free and glossy by wiping them with a damp cloth. Repot in spring, only when plants get crowded and need dividing. Keep the rosette of the leaves at soil level. Use a wide, heavy container to prevent toppling. This tall plant can get top-heavy. Light: Bright light to full sun. Will tolerate low light. Water: Keep soil lightly moist in the growing season. In winter, water just enough to prevent the soil from drying out. Take care not to water the center of the rosette of leaves because they'll rot easily if kept wet. Humidity: Average room (around 40% relative humidity). Mother-in-law's tongue will tolerate dry air, but keep it away from air vents or drafts. Soil: Soilless or cactus potting mix. Fertilizer: Feed monthly spring through fall with fertilizer for succulent plants. Propagation: Division or leaf cuttings. Sansevieria is easy to divide because it has shallow roots. Simply turn the pot on its side and pull out the entire plant. Use a sharp knife to cut through the thick roots and pot each clump separately. To propagate Sansevieria by leaf cuttings, cut leaf into 2-inch (5 cm) pieces and place them right side up (the way they were growing) in moist perlite or cactus potting mix; they will grow plantlets around the base of the cuttings.